The project celebrates the band’s 35th anniversary and spans their entire studio recording career – from their 1985 debut, "Killing Is My Business…And Business Is Good", to the 2016 Grammy Award-winning release, "Dystopia." 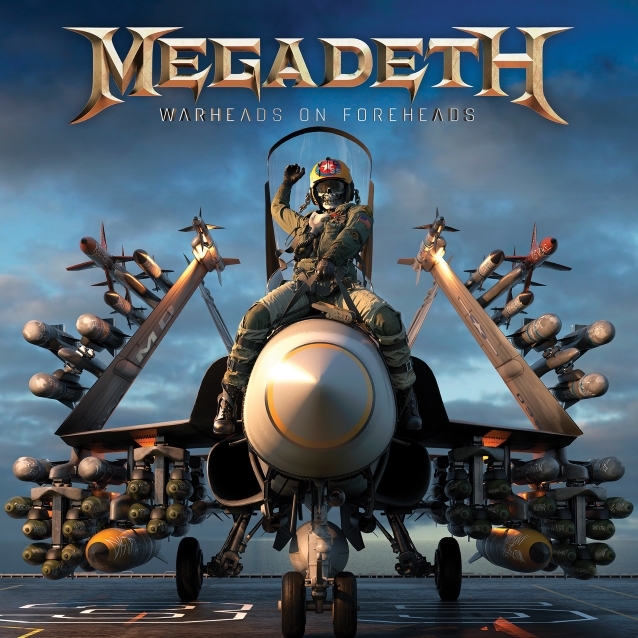 "'Warheads On Foreheads' is a US military term for targeting efficiency,” explaisn Dave Mustaine. “It's all about using the right tool for the job and these tracks were created for maximum destruction (or stopping power, or something else!)." The compilation will be available in multiple versions, including 3CD, 4LP and digital formats, while a limited-edition, 4LP set pressed on silver colored vinyl will be available exclusively through the band's online store. "Warheads On Foreheads" is available for pre-order NOW at Amazon. Ahead of the hits collection, Megadeth will continue their ongoing reissue series this month with a pair of albums from the early 2000s: 2001's "The World Needs A Hero", and its follow-up, 2004's "The System Has Failed." Due February 15, the reissues mark the North American vinyl debut of both records and their first appearance on CD after being out of print for the past five years.